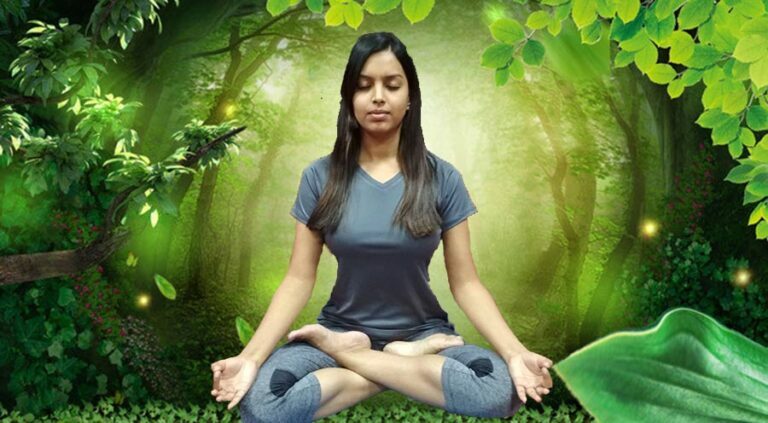 Chidakasha Dharana is a visualization technique and at the same time, it is a meditational practice or meditation in itself. Through the practices of Chidakasha Dharana Meditation, one can experience the presence of the guru, the great master, within himself. This guided meditation technique can unlock the gates to the secret realms of awareness and states of consciousness which are beyond the mortal sight. Chidakasha Dharana is a secret practice of tantra which leads to the state of meditation and tranquillity of mind. It also balances the emotions and creates equilibrium in the physical body. Chidakasha literally means ‘the space of consciousness’. It is the space behind the forehead. It is the viewing screen of Ajna Chakra, the jet black room where the psychic phenomena manifest for the benefits of the physical mind. It is the link between the conscious, sub-conscious and the super-conscious. Chidakasha Dharana is concentration on the inner space. The practice has been divided into four stages. Sit in any comfortable meditation posture with hands placed on the knees in Chin or Jnana Mudra. The spine is held in an upright position with back, neck, and head in a line. Become aware of different sounds taking place around you. It may be the chirping sound of birds, the ticking of the clock, the noise of the moving fan, my voice that you can hear in the form of instructions etc. Become aware of your whole body. Maintain an unbroken awareness of your whole physical body. The more aware you are of your physical body, the steadier the mind becomes. Try to visualize the space in front of your closed eyes. Enter that infinite space which has neither dimension nor color. During the practice, you may come across some colors, across some forms or even an illumination may appear. This may be due to physiological fluctuations in the body or the release of old Samskaras or impressions stored in the subconscious mind as archetypes. When these Samskaras or impressions are released, they emerge in the form of thoughts, visions and emotional expressions. Keep your eyes closed and remain aware of the inner space. This is the space of the mind or consciousness. Keep on observing whatever appears there. Just keep the eyes closed and let the visions come. They may be static or changing. Keep on watching with the detached awareness whatever arises in your mental space, whether pleasant or unpleasant. Keep your eyes closed. Do not open them until I ask you to do so. Keep the body still, as still as a statue. As the body becomes immobile, the inner vision also changes less. Sometimes one form will remain for some time and then take another shape, or it may keep on changing continuously. Keep on observing your mental space until your eyes become more relaxed, and the visions become fewer. Keeping the eyes closed, try to steady your vision and focus on one object of your choice, whatever you can comfortably maintain. It can be an image a statue, a person, a plant, a flower, a painting, or even a light. Choose anything which you can comfortably maintain in front of your closed eyes. Try to witness the vision you have chosen, whether it continues or disappears. Keep the same vision continuously. It should not come in any other form. For instance, if you are trying to see your deity sitting in a certain pose, then see Him in that pose only. If a vision comes of your deity blessing you, still try to return to the same vision of the deity in a sitting only. Continue visualizing whatever you have chosen and reject all other forms. Try to make the vision as real as if you were looking at it with your eyes open. Once the vision becomes as steady, firm and clear as normal reality, you should then try to remove it. Do not visualize anything and just become aware of the infinite, inner, dark space. Infinity has no color, form or dimension. Keep on witnessing the dark space, infinite space. From the infinite space, come back to your external awareness. Become aware of your physical body and any feeling that you might be experiencing, whether physical, mental or emotional, comfortable or uncomfortable, pleasant or unpleasant, calm or disturbed. Then become aware of yourself practicing Chidakasha Dharana. Become aware of the surroundings and of the people surrounding you. Become aware of your whole environment. Inhale deeply and chant Om. Gradually move the body and open your eyes. By the practice of Chidakasha Dharana, divine powers can be derived. The most important point is the achievement of the state of meditation. Many other faculties of the mind will open, even before you reach the state of meditation. They are called siddhis. But siddhis are not the goal of the practice. If you get lost in the siddhis, then the actual state of meditation will not be achieved. So the siddhis are not to be practiced or taught. They are to be safeguarded and used only for the achievement of meditation.